VOGONS • View topic - The All-amazing super-de-douper SuperPi thread! As a spinoff of my K6-2+ 500 thread, on the suggestion of Tetrium, creating here a seperate thread for everyone from far and wide to post their Retro system's SuperPi results. There is a copy (Freeware) of SuperPi 1.1 (Modded for decimals) attached to this post that will run on Win9x operating systems all the way to XP. Works on 7 too, but this versions not for multicore CPUs. As SuperPi relies on the x86 instruction set, it should theoretically run on 486 machines as well, but haven't tried this yet. Last edited by maddmaxstar on 2012-1-24 @ 04:45, edited 9 times in total. Re: The All-amazing super-de-douper SuperPi thread! Awesome! Keep'em coming! I just updated my top post with more results, including results from my PIII-class chips as well as my Athlon64 3700+. I was actually surprised to see that the PIII 650 was quicker than a Celeron 800 (a result that was the same in 3DMark01 as well). Must be the extra Cache, plus I think the PIII's Cache technology is more advanced (IE: 16 way vs 4 way). Not sure. I should do this, I've got a stack of slot1 chips of varying speeds as well as several celerons with slocket adapters. maddmaxstar wrote: I was actually surprised to see that the PIII 650 was quicker than a Celeron 800 (a result that was the same in 3DMark01 as well). Must be the extra Cache, plus I think the PIII's Cache technology is more advanced (IE: 16 way vs 4 way). Not sure. I noticed this exact same thing. The Celerons always were roughly 70% of the speed of it's bigger Pentium 3 brother. Last edited by Tetrium on 2012-1-27 @ 16:53, edited 4 times in total. Unfortunately my K6-III/400 rig refused to load Windows for some reason so no results from that rig. PhenomII 3.2Ghz DDR3-1333(cl high as I went cheap ) Windows 7! And yes sgt76, you read right. I actually got meself a netburst rig now! Tetrium wrote: And yes sgt76, you read right. I actually got meself a netburst rig now! Haha... I actually did do a double take when I read your post!! Welcome to the club! Last edited by sgt76 on 2012-1-24 @ 02:50, edited 3 times in total. I've just tested my laptop. Just for kicks I tested my laptop (MacBook Pro Early 2011: Core i7-2720QM 2.2Ghz, 8GB DDR3, Win7 BootCamp). 12.854s. Going to try my other two machines, a P133 and an Athlon 64 3500+ I have here in a bit. Last edited by MrKsoft on 2012-1-23 @ 20:11, edited 2 times in total. Just tested my Laptop. I set CPU Affinity in Task Manager to Core #2 for an added boost. Last edited by maddmaxstar on 2012-1-23 @ 19:33, edited 1 time in total. Could you try out weather the version with the decimals works in Windows 3? It would be awesome if it worked! Hah! Awesome! 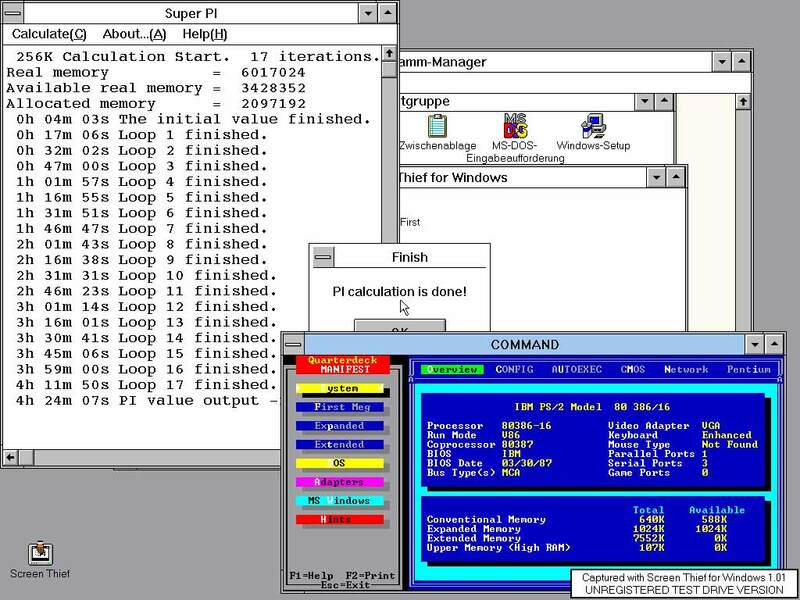 What version of SuperPi is needed for Win3.x?, I'll try it on my slower machines! Now I want to build me a couple rigs just for SuperPi again . Mod 1.5/XS uses kernel functions that got introduced in Win2K. The original version from Prof. Yasumasa Kanada works however in Win 3.x. elianda wrote: Mod 1.5/XS uses kernel functions that got introduced in Win2K. I assume that's why mine crashes?